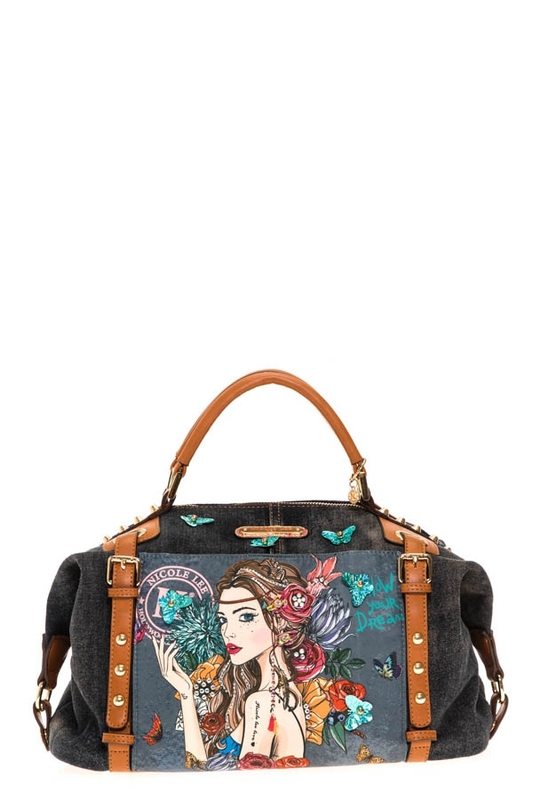 Follow your dreams in style with the Nicole Lee "Angelina Follows Dream" Denim Small Duffle Bag. Exterior Features: Made of denim with vegan leather detailing. "Angelina Follows Dream" design at front. Butterfly appliques. Dual top handles. Buckle belts embellishments at front. Signature studs. Metal zipper closure with NL monogrammed zipper pull. Snap pocket at front. Detachable shoulder strap. NL authentic medallion. Vegan leather bottom with protective metal foot base. NL nameplate at front.